I almost didn’t make it. 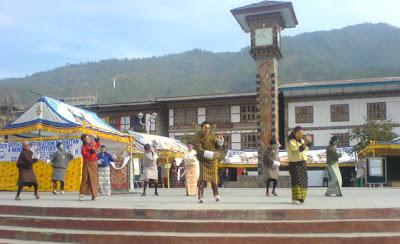 I was so preoccupied writing about Galek’s taekwondo – and watching her practice – that I almost missed this morning’s event to honour two decades of JOCV service in Bhutan. HRH Ashi Sonam Dechen Wangchuck was the guest of honour, and JOCV and JICA had arranged quite a show – from lively dancing, classical music and health checks to photo exhibitions, tea ceremony and bamboo toys, our Japanese volunteer friends had organized a lot of activities in the Clock Tower square. It was fun. I would have felt terrible if I’d missed the event. Not because it was fun, but because I have been closely associated with the JOCV program. In my previous incarnation as a civil servant – which seems like ages ago – I requested for, worked with and benefited from the services of many Japanese volunteers. And the range of volunteers I’ve worked with is extensive. They include two auto mechanics, an architect, a lacquering expert, a doll maker, a leather expert, a metal caster, a rebar fixer, a plumber, and an electrician. All good people who have contributed a lot to improving vocational training, particularly in zorig chusum. They made a difference. To them I offered my quiet, heartfelt thanks. I’m glad I made it.